The Taj Mahal (Crown Palace) was built by a Muslim, Emperor Shah Jahan in the memory of his dear wife – Queen Mumtaz Mahal at Agra in India. It is an “elegy in marble” or some say an expression of a dream. It was overwhelmingly emotional to stand by this monument to love. 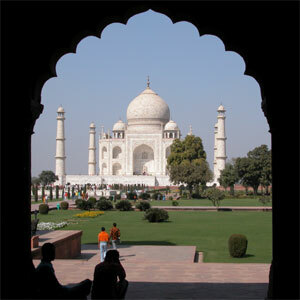 The guide turned to our Indian colleague – Ashok, and whispered a question in his ear. Ashok reassured him and the guide pointed up to the bronze spike on the top of the dome. Once that spike had been covered in gold but this had been removed by the British during their rule in India. The guide had checked, apprehensive that our reaction might be like some other British who were uncomfortable at hearing this fact. In contrast Sonali was born into a caring family in Rajasthan. Talented and motivated she nevertheless followed her family’s wishes and committed to an arranged marriage with the son of a wealthy family in Agra, 200 miles from her home. As is the tradition, Sonali moved into her in-laws’ home and dedicated herself to her husband and their children. Her home was elegant, cool and a home to four generations of the family. Her great grandfather now 100 years old sat gracefully and peacefully in the shade on the porch as his grandchildren cycled round the garden under the arching bougainvillea. The servants bustled about letting in visitors and serving them deep gold tea. An idyllic existence? Yes at one level indeed it is but Sonali could not expect to travel further than her own family’s home town and even then would not be expected to ever travel alone. Her talent was restricted to serving the home and her in-laws. Many millions of educated Indian women dedicate their lives in this way. But more recently I returned to work with Brainobrain, Ashok’s family business dedicated to the development of the thinking and learning power of the children of India. With a structured syllabus they teach the children how to do complex mathematics using at first an abacus but subsequently to do the same with their mental agility only. What is the point you might ask in a world where computers can do the most complex calculation in response to a single key stoke. The trainers and the facilitators in Brainobrain do much more than teach the children to do clever maths. The children learn to memorise the abacus moves in their muscles so that the abacus itself becomes redundant. And in so doing they are also learning how to use their whole body to learn and simultaneously build motivation, a sense of competition and a belief in themselves. Brainobrain is rebuilding the Indian heritage of thinking power and as such they are building the leaders of the future not just for India but for the whole world. And India already has one of the most progressive leaders in the world – Dr APJ Abdul Kalam a Muslim nominated by the Hindu Party – BJP (Bharatiya Janata party) and supported by the majority of the other parties. He won the Presidential Elections with 89% of the vote being cast in his favour, in spite of the fact, that he has no political experience. His goal is for India to be a world super power by 2020. Learning of the corruption in one of the northern states he summoned all the politicians there to a briefing where he challenged them to explain why they were never cited by the children of that state as their role models for the future. India has a growth rate of 9% per year and that is expected to be a conservative figure in the years to come. It has its troubles but it also has a culture where people of different faiths, different languages and different traditions live side by side. A first visit might mistakenly lead you to believe that all is chaos but much of that chaos is the result of some of the most rapid growth and development in the world. None of the northern European sense of structure and order here. Freedom is a prized value and Indians admit and recognise that chaos is sometimes the price for that but it is a price that they are prepared to pay. If you think that Europe offers an example for new India you would be wrong. India is the new Europe. We have a lot to learn here. Modelling excellence with NLP gives us all the chance to learn how to capture the best of the best and reproduce it in other cultures. There is nowhere I would rather start to do this than here in this multi cultural, multi faith country. Brainobrain and the three brothers who run this Anand, Arul and Ashok succeed in the unexpected. A southern India based business (although that is too clinical a term to describe what they do), they have created a network of trainers and facilitators and franchisees not only across the south but unusually across the north too where Hindi is the language, a totally different tongue to their native Tamil Nadu. They have representatives in every state and the news of their success is now spreading to places outside of India. Ashok was preparing to fly to Dubai where one of their teachers had moved and was preparing to start a centre there. So a small growing Indian business you might think? No they are already training 12,000 children; expect to have 25,000 by the end of next year and a goal of 100,000 in 10 different countries by the end of 2010. And last year I returned to Kerala to train the Brainobrain team in the principles of feedback, teamwork and modelling excellence. I am not entirely sure who was teaching whom. The learning was a mutual process. And there is no doubt that Spence my husband and I have been so very, very enriched by our work and time with this team in India. And late in February we extended this training out to more of the trainers and teachers of the children. And the goal? To create at least 10,000 NLP Master Practitioners of the children throughout the country in two years time. Indeed they are already Master Practitioners; the training will be an acknowledgement and confirmation of all that they already do and know unconsciously. And we will be modelling the best, Mahatma Gandhi, the current president, and from other countries leaders such as Nelson Mandela. Brainobrain knows very well that they are the caretakers of these young leaders of the future. It took 22 years to build the Taj Mahal a vision so well planned that the architect knew in advance to create 22 steps to the startlingly white terrace that surrounds this majestic palace. And 22 years from now most of the children in this programme will be approximately 30 years old… young leaders of the world. It is a measure of the generosity of heart that is so characteristic of the Subramanian brothers that knowing the family of Raji they offered to bring her and her friend Sunita to Delhi where they gave them work at their offices there. I met Raji and Sunita only last week. She organises the office there, and has become one of the teachers running a class for the children every week. She and her friend are gracious, humble and very, very talented. Her family have entrusted her care to the brothers and their family and they are very intelligent of this huge responsibility. It is likely that it will be they who find her husband – and they will be sure to find a husband who supports her and her personal goals. And Sonali… well she also is a teacher and a franchisee for Brainobrain now. Part of her home in Agra has been converted to a classroom where each day she teaches these young leaders including her own children. I sat at the back of her class and admired her confidence, her talent and her authority as she built champions not just in Maths but also in life skills and global awareness. Brainobrain has 350 women teachers throughout India and 250 franchisees of which 95% are also women teachers with a career and a dedication to developing the culture of India. And the spire on the Taj Mahal… well I wondered about suggesting to the British Government that they might now replace that plundered gold. And I might still do that. But something more significant occurred to me and that is that if I and others like me can support these passionate and dedicated Indians to achieve goals such as the ones that I have described here then perhaps we might consider ourselves to be replacing that gold bit by tiny bit.